The low-cost carrier is making more city pairs, this time Billund-Kiev and Copenhagen-Lviv. Already serving Denmark’s Billund Airport from eight destinations in Poland, Lithuania, Romania, Bosnia and Herzegovina and soon Austria, Wizz Air confirms that from March 2 next year it will add Ukraine to the list. Then, on March 3, it will connect Copenhagen with Lviv. 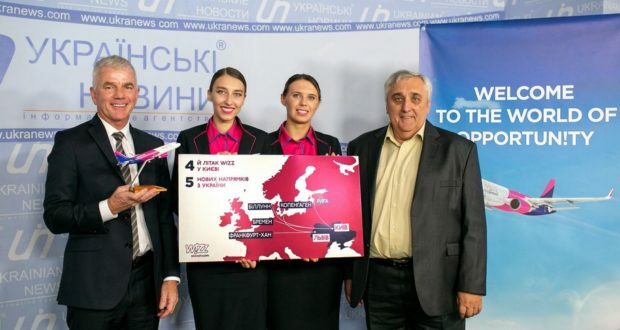 The “ultra-low-cost carrier” will begin its twice-weekly service, on Tuesdays and Saturdays, between Denmark’s second busiest airport and Kiev Zhulyany flying the 1,500-kilometre journey using a 180-seat A320-200. Of the 24 airlines currently flying between Billund and 29 different country markets this summer, Wizz is the sixth largest carrier in terms of weekly one-way seats. Next summer, Wizz Air will operate 19 weekly frequencies from Billund on nine routes, providing in excess of 3,500 one-way weekly seats to destinations including Bucharest, Cluj-Napoca, Gdansk, Iasi, Tuzla, Vienna (a twice-weekly service starting in November), Vilnius, Warsaw Chopin and the now-confirmed route to Kiev. Billund is part of a Wizz Air expansion in Ukraine where the airline is opening five new routes, two of them to Denmark. There will be routes from Kiev to Bremen and Riga besides Billund, while Lviv in western Ukraine will get new links to both Copenhagen and Frankfurt-Hahn. Copenhagen-Lviv – also known as Lwów to Poles and Lvov to Russian speakers while some in western Europe might recall it as Lemberg – will start on March 3, for Wednesdays and Sundays with a new A320. “The new route to Lviv is exciting, both for Danish business and for the Danish tourism industry,” says Peter Krogsgaard, commercial director of Copenhagen Airport.